My nonstress test on Monday morning was quite the event. At first, Baby B wouldn’t cooperate and stay on the monitor. Then once he did, he fell asleep and we had to wake him up to get a good reading. Meanwhile, my blood pressure was a little high. They ran some lab tests, and my doctor happened to be there for a C-section. She checked the results and decided that it would be fine to send me home, since the tests didn’t show any signs of preeclampsia. On Thursday, I went back in for my regular NST, and they re-ran the lab tests. Then I went straight to my doctor’s appointment where she told me that the lab results looked perfect. She also checked my cervix, but it was still just 75% effaced. I’ll go back in on Monday for another NST, and we’ll see how my blood pressure looks then. My doctor seems to think that it might keep rising, in which case they would consider inducing me early. So we’ll see what next week brings. 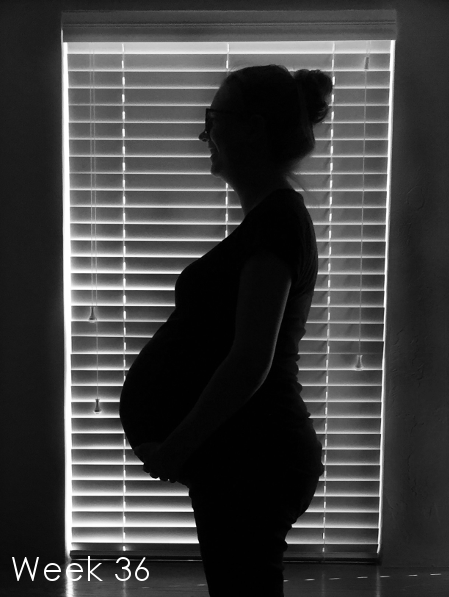 36 weeks is a big milestone for twins, so we’re glad to have made it this far. We’re so excited to meet these little guys in two weeks or less!